Unless you’re used to your iPad’s slippery edges or can use it in any positions whatsoever, iPad has never been a safe gadget, to be honest. Hence, it becomes imperative to have a mount kinda accessory that could keep your lovable gadget in a workable position. Lookbad’s Airholder is one such accessory that will take all beating to ensure the safety of your iPad or Kindle Fire. The swing arm mount is adjustable, extendable, flexible, chargeable and foldable, everything one could need. With the current popularity of the iPad, a great tablet accessory like an iPad holder is essential alongside. 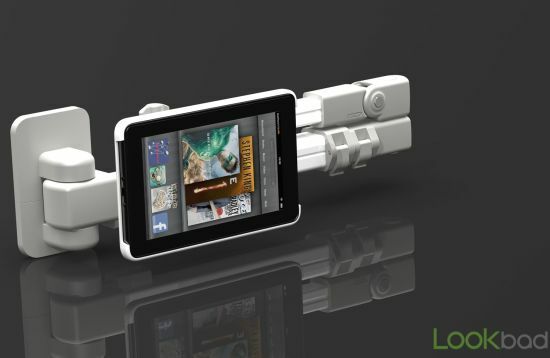 LookBad has invented a swing arm mount that suspends a tablet for comfortable use. The AirHolder is the first extendable and foldable arm on the market. Each extension of an arm is ensured to be smooth and can be secured in place with safety fasteners. The iPad holder has many joints for rotation and a wide angle radius, one can adjust the tablet to any desired position. To further maximize comfort, there is a built in charging wire in the AirHolder for charge-while-use function so the tablet doesn’t have to be left by the sockets halfway. If there is worry about dangling wires, no fret, for two clips are provided to clip the charging wire close to the AirHolder arm. Don’t forget to fold the arm after use so that it takes up just a tiny space in the bedroom. At the adaptor of the AirHolder which connects an iPad, there is a safety lock to prevent any possibility of the tablet falling from a dangerous height. Connecting the iPad and the AirHolder iPad holder would be the AirCase, by just a twist and click. The AirCase acts as a protective casing from wear and tear of daily use, but the AirLock being its most valuable system as that enables locking unto the AirHolder. Finished with a soft fabric surface, the AirCase is usually purchased alongside an AirHolder. With the increasing importance of how technology plays a role in daily life, it is usual to carelessly overlook the adverse side health effects. While reading an article or watching a movie, the arms support the tablet, shoulders flexed and neck inclined. It’d probably be fine for 10 minutes or so but craving for entertainment goes a much longer way than that. With the AirHolder, those problems are easily eliminated. Days of shoulder strain and neck pain are near their end. Available in both black and white to suit a home’s appearances, the AirHolder iPad holder can be a service to the bedroom, living room, kitchen, anywhere you name it. It’d be a furniture one would love to treat their iPad using experience to.